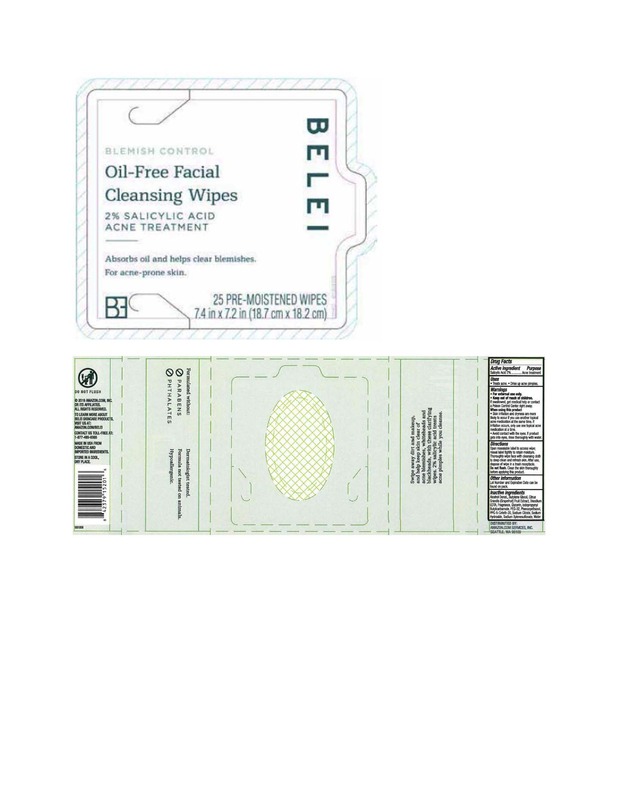 Proprietary Name: Belei Oilfree Facial Cleansing Wipes What is the Proprietary Name? Belei Oilfree Facial Cleansing Wipes with NDC 72288-822 is a a human over the counter drug product labeled by Amazon.com Services, Inc. The generic name of Belei Oilfree Facial Cleansing Wipes is salicylic acid. The product's dosage form is solution and is administered via topical form. UsesTreats acne.Dries up acne pimple. When using this productSkin irritation and dryness are more likely to occur if you use another topical acne medication at the same time.If irritation occurs, only use one topical acne medication at a time.Avoid contact with the eyes.If product gets into eyes, rinse thoroughly with water. DirectionsOpen resealable label to access wipe; reseal label tightly to retain moisture.Thoroughly wipe face with cleansing cloth to deep clean and refresh skin.After use, dispose of wipe in a trash receptacle.Do not flush.Clean the skin thoroughly before applying this product. Other informationLot Number and Expiration Date can be found on pack.